Darning samplers probably originated in Northern Europe, but they soon became an important part of the basic needlework training in English Schools. They were also made in America, but to a lesser degree and most of the output known is from the Westtown School, and completed under Quaker instruction. Darning samplers were highly practical pieces as the purpose of these samplers was to teach mending on a variety of different fabrics and weaves. As textiles in the 18th and early 19th centuries were such valued possessions and were often passed down through the generations, mending was a crucial skill to be taught and learned. 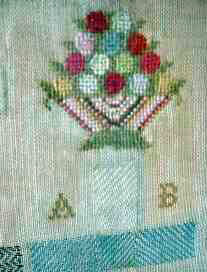 The darns were worked in two different colors by the counted thread method, usually in the shape of a cross. This made a most attractive pattern where the two shades met and also had the advantage of enabling a teacher to quickly spot a mistake. Sometimes the darns were worked over specially cut holes or L-shaped tears. 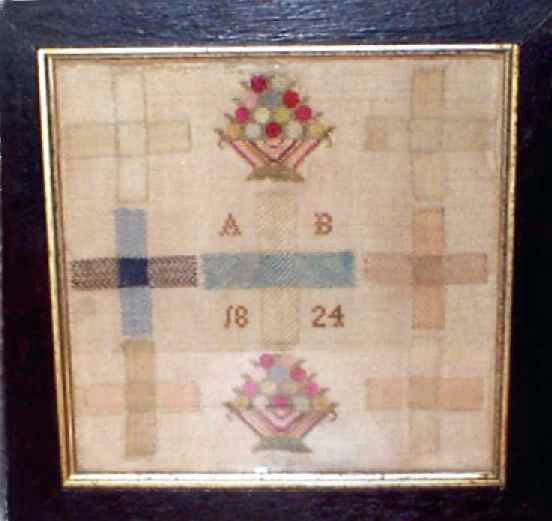 This English darning sampler is dated 1824 and contains the initials of the maker, "AB". Besides the seven darning examples it also contains two splendid baskets of fruit further showing the makers proficiency with the needle. There is a wonderful graphic quality and sophistication about the piece, yet it also possesses a sense of charming naivete because of the inclusion of the baskets of fruit. The bottom basket of fruit looks to be lighter, but it is just the reflection from the flash. Both baskets are bright and vibrant. The sampler is worked in silk and wool on linen and is in excellent condition. It appears to be in its original frame with inner gilded border. It has been mounted on acid free board as a conservation measure. The frame measures 13.5" square while the sampler itself is 10.2" x 10.4".